Can we provide "Add more field" option to visitor to dynamically add one or a set of fields? The example scenerio is an order form where they will be asked to fill up a set of option (item name text box, quantity, price(manually entered by buyer)). And they will get a "add another item" link which will bring up another set of option for them to fill up. Sadly, we do not have a feature that allows dynamically adding fields on a form. A workaround to your goal is by using conditions to hide and show fields according to the options selected by the user. Check out this sample form to see this workaround in action. Basically, what you need to do is create copies of the set of fields that you'd like the users to be able to add, and the radio button which will ask the user whether he/she would like to add a new field. 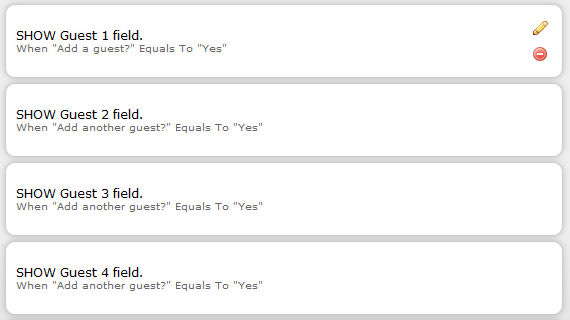 In my sample form above, I have four copies of the Guest Name field and the "Add a guest?" radio button. 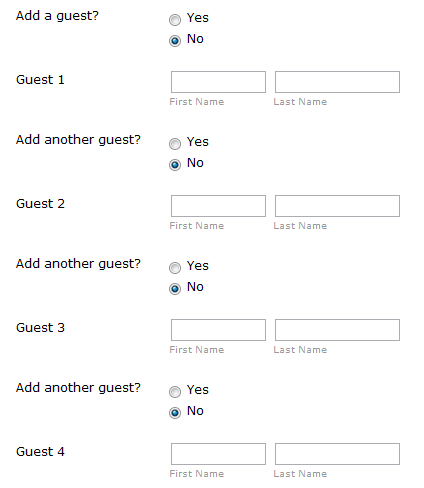 Then create a condition that will show the next Guest Name field and the next "Add a guest?" radio if the previous "Add a guest?" radio option is equal to "Yes". 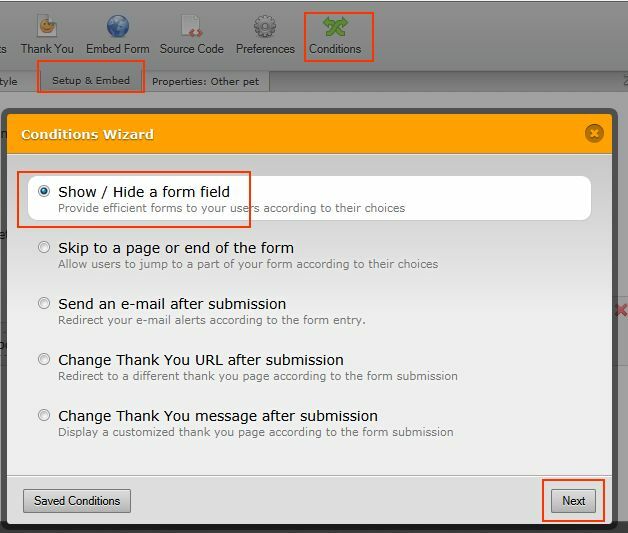 Click Setup & Embed > Conditions > Hide/Show a form field then click Next. If you need further help with this workaround, just let us know. Click here to learn more about conditions. That should work good as a work around. Thanks. For a feature request, to have conditional action on "link clicks" would be great. That would allow us impliment these type of hacks in a better loowking way.